This is attempt number 1 at a new cookie variety I am working on. I wasn't planning on blogging about this because I didn't quite get what I was shooting for (I will add more green food coloring next time). 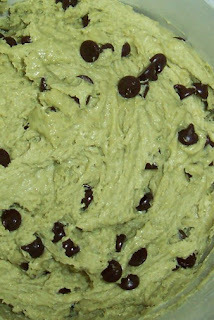 But I love the pictures of the green cookie dough so I thought of posting it here. 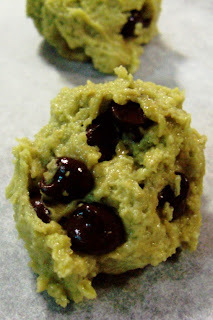 The the cookie dough looks like pistachio (or mint) chocolate chip ice cream. I am using pistachios instead of walnuts so I thought it was a nice touch to add a bit of green coloring in the dough. Of course the flavor is the same, still the same chocolate chip cookie, the change is mostly aesthetic.